Washington Monthly | Talking About Obamacare: Does Policy Debate Matter? American politicians have debated the Affordable Care Act since it was introduced to Congress in 2009. Have these debates affected what citizens think about the ACA? Daniel Hopkins can’t find evidence that those myriads of words mattered. 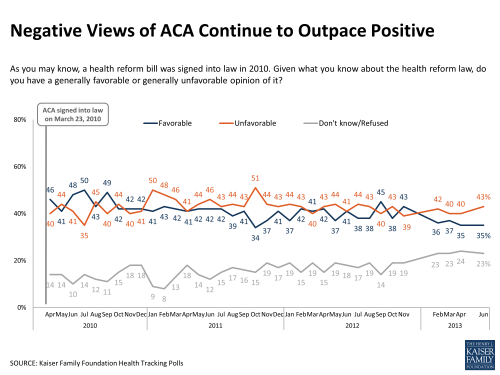 So, health policy bloggers: If Reid, Boehner, and McConnell can’t sway public opinion, despite the audiences they command, what do you hope to accomplish? Hopkins is interested in the relationship between, on the one hand, the public debate about the ACA carried on in the media by the political elite and, on the other hand, public attitudes toward the ACA. To study the elite debate, he gathered 1488 press releases about the ACA issued by Senators in 2009 and 2010. To study public attitudes, he obtained text written by 30,000 survey respondents to the Kaiser monthly survey of public opinion on health policy. These masses of text allowed him to look at how elite debate and public attitudes evolved over time. Opponents of the ACA used different words. For mass- and elite-level opponents of the ACA, the legislation’s cost and the increased governmental role it authorized were central reasons behind their opposition. Hopkins interpreted these word patterns as ‘frames’, that is, contexts of meaning that structured how people thought about the ACA. Classic studies by Tversky and Kahneman showed that manipulating the framing of a survey question strongly affects how people understand and respond to the facts in that question. Issue frames are rhetorical structures which emphasize a subset of the considerations relevant to an issue. Political issues are usually complex, giving elites the capacity to focus on aspects of the problem that advantage their side of the argument. Hopkins viewed the elite debate as a contest over whose framing of the argument would prevail in public discourse. The Senators were trying to shape how the public processed information about the ACA and thereby influence public approval of the bill. To see whether the elite debate had such influence, Hopkins charted the rise and fall of many rhetorical frames in both the Senatorial debate and in public opinion. If elite debate swayed public opinion, we would expect that a change in the prevalence of a frame in elite discourse would be echoed, at some lag, in public opinion. So how much influence did Senators have on public opinion? Not much. …in contrast to the variability of elite frames over this period, public opinion moves only gradually, and the arguments Americans use prove stable. Before health care reform became highly salient in the fall of 2009, Americans explained their views using much the same language they used during and after the most publicized chapters of the debate. Moreover, Ezra Klein and Evan Soltas noted that not only were the frames stable underneath public opinion toward the ACA, but also public approval of the ACA has remained more or less constant. So if two years of Senatorial debate were futile, what can health policy bloggers hope to achieve? The immutability of public opinion should give pause to partisan bloggers. If you view yourself as a writer in service to a political movement, a soldier in the skirmishes over the daily meme, then give up. You are throwing pebbles, hoping to breach a castle wall. Instead, we should be more ambitious. Public opinion may have moved glacially over two years. But if you look back four decades, public opinion has changed profoundly about race, gender roles, and sexual preferences. Great writers play a role in great changes. Consider J. S. Mill, writing about the liberation of women in 1869, when this was about as plausible as the colonization of Jupiter. (Or consider Andrew Sullivan writing about gay marriage in 1995.) And yet much of what J. S. and Harriet Taylor Mill imagined has come to pass, in part because Mills’ writing helped make it seem possible. some ethical explanations-for example, about slavery, sexual subordination, and suffrage extension-have force. That force derives from the general claim that the injustice of a social arrangement limits its viability… Social arrangements better able to elicit voluntary cooperation have both moral and practical advantages over their more coercive counterparts. Few bloggers will be the moral architects of great social movements. But we can perhaps be the finish carpenters of moral and political frames. We can improve the day’s debate by providing a critical scientific reading of the stylized facts in rhetorical frames. We can try partisan values against the best reasoned moral arguments. Through slow, collective work, the quality of argument will improve on both sides and at both the public and elite level. If there is ethical force in these frames, our refinement may bring it to the surface.